NEW YORK, USA -- For those following Russia’s invasion of Ukraine, an ongoing source of concern is where Russia will draw the line. 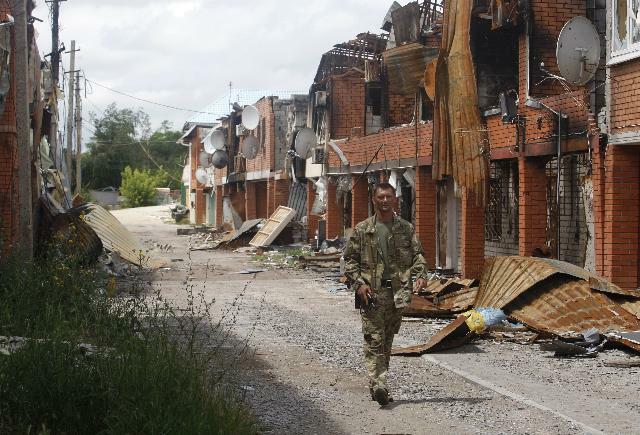 A Ukrainian serviceman walks along destroyed houses in Shyrokyne, Donetsk region in late June. Common wisdom says if Ukraine continues to resist, Russia will commit more forces and overrun Ukraine—possibly continuing its momentum into Estonia or Poland. As members of NATO, an attack on either of those two countries risks invoking Article V, NATO’s common-defense clause, thus drawing Europe and America into war with Russia, inexorably leading to World War III and nuclear exchange. Well, there’s another cause for concern. Ukraine is much stronger than people give it credit for. Up until now, the Ukrainians have been fighting with one arm tied behind their back—much of their combat power has deliberately been held in reserve, to risk provoking Russia into allocating more forces to the fight. The last time the Ukrainian military mounted a calculated offensive against the separatists, in August of last year, it experienced quick success. Russia had to move thousands of soldiers across the border to shore up separatist resolve, and assisted the separatists with artillery, tanks and anti-air assets (including the Russian AA battery that shot down Malaysia Airlines Flight 17). Since then, there has been a status quo of sorts—not to be confused with a cease-fire, as casualties by the dozens occur every day. The battle in East Ukraine has reached equilibrium. Many in the West believe that Russia can decide to break this status quo at any time with a quick push; it can blitz through Ukrainian lines and make its way to Kiev and Odessa—or beyond. Ukraine is incapable of standing up to the Russians, and their defensive capabilities are barely adequate to resist an invasion. Presumably, conventional wisdom is the same in Russia because its military has not made any serious, concerted effort to overwhelm Ukrainian positions. Up to this point it has made strong probes against Ukrainian lines, or maneuvered to surround National Guard positions, and then negotiated surrender with Ukrainian authorities. But Ukraine does have sophisticated defensive capabilities, which are increasing with every day. The Ukrainian population—especially Kiev and parts of the West and South—feels more and more invested in the struggle as friends and relatives are killed or wounded on the front lines. And Ukrainian military formations are training hard. On the ground in Ukraine I spent a week in Yavoriv recently, watching my old unit, the 173rd, train two companies of Ukrainian National Guardsmen (NGU). It was very impressive: Ukrainian soldiers moving and communicating tactically at a level that matched or exceeded most conventional U.S. units. For nearly seven years, I served as an infantry officer (over two of which I spent in Afghanistan) in combat; in my time training Afghan police and soldiers, I never saw a unit of Afghans that looked as professional as the Ukrainians. Throughout that week, I heard artillery and tank fire—Ukrainian artillerymen training to increase their capacity to fight together as small units, working with mechanized assets, calling for fire from mortars and from artillery. They were part of a unified military based on principles of merit and organization rather than Soviet authority. Ukraine can defeat the separatists. Ukraine can defeat Russia on the battlefield. Ukraine and its military does not know this, but it is possible. In fact, Russian overconfidence, Russian complacency and broken Russian doctrine makes it not just possible but even likely that a decisive, surprise combined-arms attack by a well-trained, reinvigorated Ukrainian military will be able to achieve complete surprise over its adversaries, surround them, and wipe them out. The longer it waits in Ukraine, the greater the chances that its military forces will encounter a disaster not faced since World War II: the encirclement and destruction of a Russian battle group. Every week that passes, the Ukrainian military is growing stronger and more confident. Every week that passes, the Russian soldiers and units become more certain that they have the advantage, and that their Ukrainian adversaries are weak and unmotivated. This is the greatest risk we face for World War III. Not that Russia defeats Ukraine and moves toward Poland and Estonia, but that Ukraine wipes out the Russians currently in Ukraine, and Putin is forced to take some drastic action to prevent further losses. After all, why should Ukraine not feel entitled to take some of Russia’s territory in return for their lost Crimea? And who will be there to stop them, save demoralized and confused Russian conscripts? I hope Western negotiators are able to help Putin see the folly of his position in Ukraine, and sooner rather than later—the longer he stays in Ukraine, the more likely it is that he will suffer a dangerous and humiliating reverse. Good analysis, it is right on a money. Encouraging and inspiring perspective. I hope it's realistic.